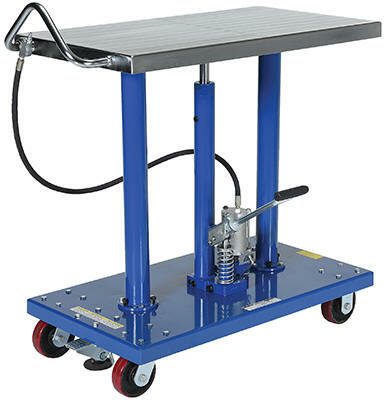 Foot-operated hydraulic lift tables are built for heavy duty shop use such as lifting dies and castings, moving machine parts, positioning welder’s work, leveling feed material for pump presses, conveyors and press brakes, and similar material handling jobs. Posts are telescoping to help stabilize and support loads during operation. 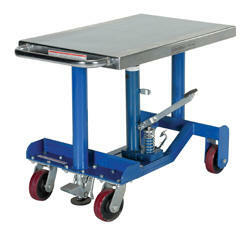 The tables roll smoothly on two (2) locking swivel casters with brakes and two (2) rigid. 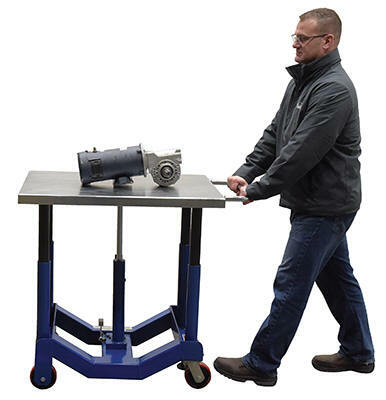 Units feature either a single-speed, two-speed foot pump, or two speed auto shifter that automatically shifts when table is loaded, for maximum operator convenience and safe platform lowering. 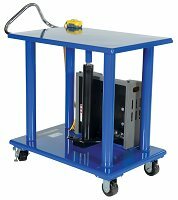 DC units include a 12V DC electric motor to raise and lower the platform. They also include a battery, on-board charger and a hand control on an 8 foot coil cord. 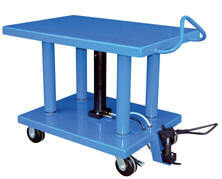 Model HT-02-1616A and HT-03-1616A includes a platform that swivels 360 degrees for use as a turntable. Model HT-02-1616A, HT-03-1616A and HT-05-1818A standard with a removable rubber platform cover. 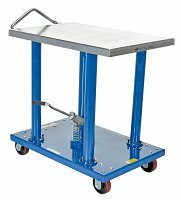 Partially Stainless Steel Post Tables feature a zinc plated pump assembly and leg posts while the platform, base frame, handle, casters rigs, and hardware are stainless steel. (lbs) # of Posts Caster Size/Type Wt. 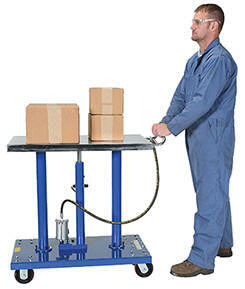 Air Hydraulic Post Tables are great in manufacturing or distribution facilities when space is limited. 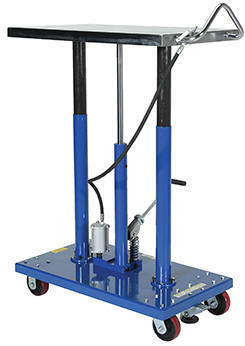 The single speed foot pump and hand held push button control (reciprocating air/oil power) raise platform to the desired location. 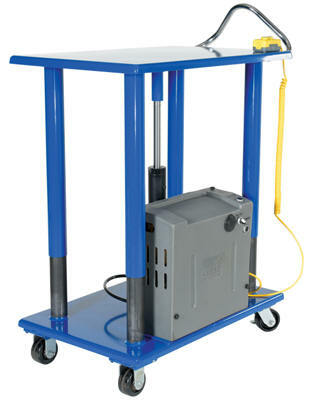 The foot pump can be utilized to maneuver the table height to a precise position. 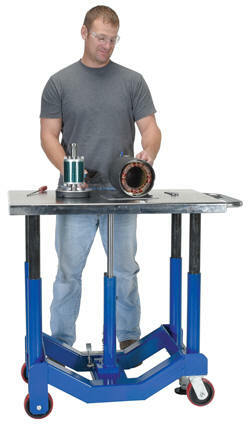 The unit requires a minimum hose diameter of ¼" and air pressure of 72 to 100 PSI. 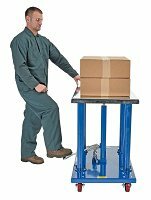 The Linear Actuated Post Table provides an economical option to industrial and commercial applications. 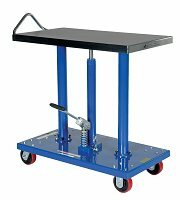 The table can be maneuvered to a precise position during raising and lowering. 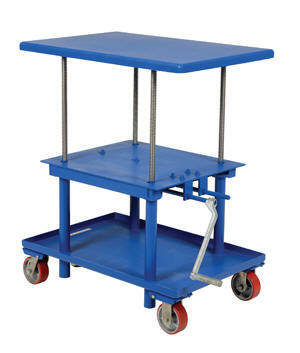 The linear actuator does not allow the table to drift down during use. 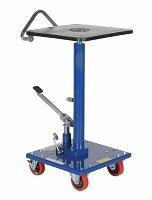 Powered by one (1) 12V DC battery and features an on-board charger and rolls on two (2) rigid and two (2) swivel casters with brake. The hand held pendant control connects to the power unit with a six foot coil cord for easy use when distance from the unit is required. An emergency stop button is standard on the hand control. 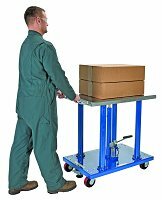 Adjustable height portable tables are well suited for a wide variety of material handling applications. 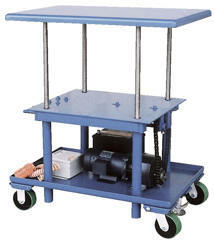 Moves smoothly on two (2) rigid and two (2) swivel 5" x 2" poly-on-steel casters with floor lock standard. All welded steel construction (deck) is blue. 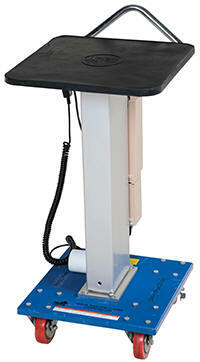 Provides positive height adjustment without downward drift. Features a two-speed manual gear mechanism to move heavy loads at 1/8" per crank rotation or lighter loads at 5/16" per crank rotation. Model PDF's Platform (WxL) Capacity (lbs) Raised Height Lowered Height Profile Wt. 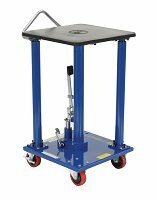 Low profile foot pump hydraulic post lift tables utilize either a formed base or a telescoping cylinder to achieve a more versatile lifting range. 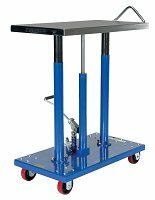 Download The Hydraulic Post Table Owners Manual or Mechanical Post Table Owners Manual in PDF format.